A Shepherd's Heart: Free Resource From A Shepherd's Heart For Celebrating Advent! 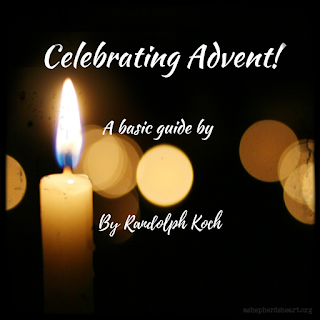 Free Resource From A Shepherd's Heart For Celebrating Advent! I absolutely love Christmas time and incorporating an Advent into the time of celebration can be a fantastic way to help focus our hearts, worship, and celebration on the birth of Christ - The reason we celebrate CHRISTmas in the first place! I created a Celebrating Advent guide, that is written from a non-denominational Christian perspective, as a simple tool/guide/starting point to help guide you in your observance. This resource is perfect to use as an individual, with family and friends or for your local church body as well to celebrate together! As you'll see, there is practical information about Advent, instructions to guide you each week of Advent including suggested Scriptures and Prayers you can use or you can obviously do your own prayers and dive further into the scriptures as well. No matter what, have fun, make it personal as you approach Him with a humble and thankful heart! Have a great Christmas and Advent celebration as you celebrate the birth of Christ! Please check out this resource and tell your friends about it as well as we seek to follow Christ and keep Him in the center of our Christmas celebration! P.S. If you haven't heard, excited to share that 2 of my Christmas Devotionals just went live in in the YouVersion Bible App and Website! Here are the links to both plans!